In an increasingly digital world, the relationship between the creative community and privacy poses some pertinent, yet unanswered questions: Is seclusion healthy for workflow? Can exposure be a bad thing? Is clout-chasing toxic or essential to a head-start in the creative industry? Cortex Creatives will host a panel talk where the panel members will share invaluable insight and hopefully shed some light on how to navigate these topics. 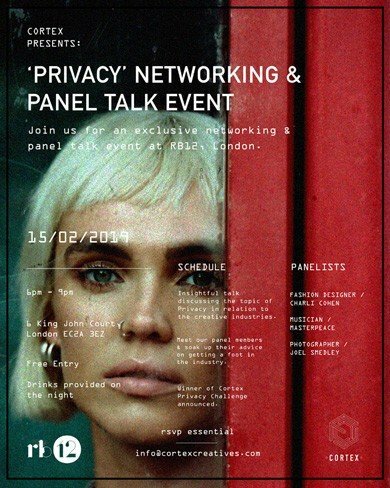 The panel discussion will take place on Friday 15th of February at the RB12 space in Shoreditch (London), followed by a networking session. The event is free and open to the public, but RSVP is necessary. RSVP link can be found, here.